also as a tip for people with oily skin, I put Milk of Magnesia on my face occasionally to give my skin a "normal" look so cover up the oil. It works great. Scars are usually not shiny except for some days or weeks right after the scabs fall off. Scars need lots of effort to improve and trying various approaches is often necessary. You can for example alternate the two methods you have suggested but only if you already have all the dermarollers. 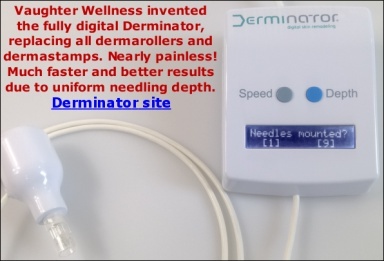 There is no need to buy a 1 mm dermaroller if you are already using a 2 mm and a 0.5 mm. It is however always useful to add a dermastamp and spot treat the scars. "Thank you Sarah. I've started Rolling 4 months ago and can already see a difference. Below are 4 month progress pictures before and after"
Thanks for the inspiring pictures. You have an incredible improvement. In fact you look like a male model in the second picture. Good job! Just wanted to post a 10 month update. 2.0 dermaroller and 2.0 dermastamp, Single Needling and occasionally a 15% TCA Chemical Peel to clean up. Way to go cesamaddict! Great results!!! THank you Mila. I'm trying..just like everyone on here..
Because it is rare for people to go public with their improvements (and even rarer to make high-quality before-and-after pictures as well) and also because this kind of feedback is so valuable to us, as a thank-you for the time and effort and an incentive to others, we are offering cesamaddict products from our store. Please email me about that, cesamaddict. Wow!! This is so encouraging!! Your skin looks so wonderful and what a great smile to show, too. I am so happy for you-Thank you for keeping us updated. Wow Cesamaddict! Your skin have improved immensely- thats a complete transformation! And your pictures have encouraged me to carry on with my dermarolling/stamping sessions (although its been around 2months)! -Did your pores get smaller because you: single needled/dermastamped them? -Do you still suction your scars? -Do you suction the whole of your face, or just particular scarring? I ask because...in your initial picture your skin have indentations and depression marks across the side of your face...and in your current picture these have significantly smoothed out...Do you think this was due to suctioning or simply because you dermarolled/stamped for so long? Honestly I dont think my pore size has changed. I think now since it's winter, my skin is less oily, thus temporarily decreasing the size of my pores. However I do roll over them and stamp them thoroughly so it could be in fact that THAT's what it is. I also think there was some pigmentation there, which cleared up with my light chemical peels. Search the forums for information regarding peels. I'd say that if you're interested in doing THAT, then do lots and lots of research and start off with weaker peels such as Glycolic Acid (if you have dry-normal skin) or Salycic Acid (Oily Skin like Me) and then work your way up to LOW PERCENTAGE TCA (I haven't gone above 15%) I think this has helped a lot also and enhances the dermarolling. -Do you still suction your scars? -Do you suction the whole of your face, or just particular scarring? Yes I still suction my scars and I usually do everything except my forehead except a few spots as my forehead, for the most part, is indent-free. However, I haven't been very consistent with the suctioning mostly because sometimes it leaves light bruising and I work in an office where I can't walk around like that. However I do Roll and stamp thoroughly. I roll my entire face and then stamp my entire face. I think this amount of "trauma" to my face is what has helped me get to the point that I'm at now. What I also do, which Sarah DOES NOT suggest, is put Retin-A on my face DIRECTLY after dermarolling. Because I like the effect that chemical peels gives my skin, it's sorta like a 2 for 1. I get to dermaroll my skin AND get a chemical peel. I dermarolled on Tuesday and my skin is started peeling yesterday (Thursday) lightly. I honestly think that THAT has helped tremendously, the combination of the two. Some people on the forums report that there is too much stinging when placing Retin-A after dermarolling but it doesn't sting me AT ALL. My skin feels however it normally feels after dermarolling. I think it's helped the texture of my skin a lot. I'm nowhere near satisfied though. I expect even great results in mid-late 2013. However I think I've reached a turning point in my skin where I've noticed that more recently, my skin has really been healing well, frown lines have been "pushed out", skin tone is pretty even, etc. I plan on doing it forever (maybe not the 2.0mm but maybe a 1.5 or 1.0 after scarring has filled in) just to maintain a wrinkle free face. I figure I started young (I'm 28 years old) so I might as well keep it up. "I do not recommend using A-Ret right after dermarolling because it is acidic and it stings when applied to the rolled skin but in some special cases such as stubborn scars and stretch marks, I do recommend it"
Are you having the TCA peels done by a Dr/Esthetician or are you doing them yourself? Also are you doing the whole face or just cross sections? I have had Glycolic peels before but feel I need something stronger-my skin does not react well with Salicylic. Thanks! I do it myself. Do a patch test if you're interested and try a very low percentage. It is very traumatizing so be prepared to stay indoors. Do tons of online research before you do it. Two years ago my skin was in really bad shape. In this picture, I wanted to show everyone what needling can do to frown lines and such. I had been a heavy cigarette smoker for about 8 years when the first pic was taken. I've since quit and have been needling for about a year for the after pic. I encourage others to post your progress pictures as well. I apologize for the bad quality of the before picture but nonetheless, the difference is clearly visible.